Apple and its rules for what can and cannot be done via Notification Center widgets is well documented. We suspect it’s this uncertainty that has led to some developers avoiding Notification Center widgets entirely. One app that hasn’t yet embraced such extension is WhatsApp, and while the app isn’t exactly known for speedy updates we thought that it might have gained some sort of quick-launch feature by now. Alas, it hasn’t but that hasn’t stopped one developer from trying to plug that particular hole on his own. 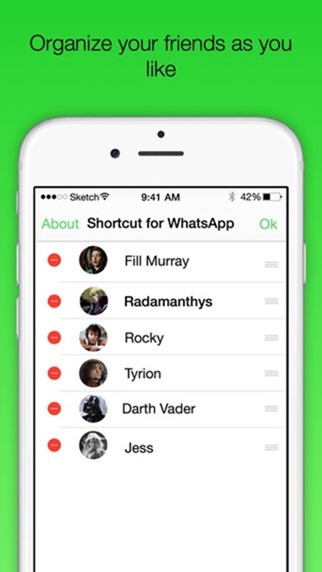 The ridiculously named "Shortcut for WhatsApp Plus – Widget to fast chat with friends" is an app / widget created by an independent developer that aims to give WhatsApp fans a quick and easy way to launch conversations without having to first open the app and then find the person they want to chat with. It’s the kind of Notification Center widget that really should be a first party thing seeing as it’s just so damned obvious, but for whatever reason, it’s not. WhatsApp Plus, as we’re going to call it, appears to do just what it claims to, and it’s free too which is probably one of the more surprising parts of this story. We can only imagine that WhatsApp will be bringing similar functionality to the table sooner or later, so you may have expected this developer to make hay whilst the sun is shining. Still, who are we to tell someone they can’t give their work away for free? 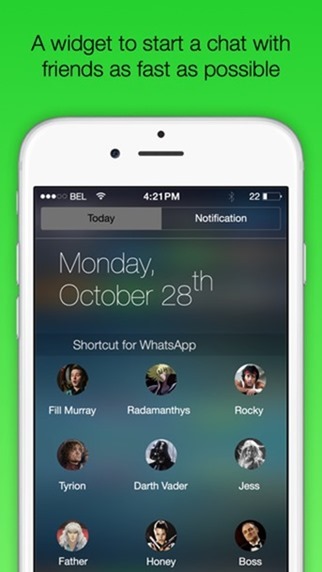 Using WhatsApp Plus is simplification itself, with the app’s own description putting it best. "Just pull down the Notification Center, choose a friend and you are all done! As simple as that," it says. And yes, it really is. People who spend a lot of time in WhatsApp will no doubt want to get this installed ASAP, especially if they’re switching between conversations a lot. In that case we suggest downloading it pretty soon because in the current App Store climate you just never know whether it will be there tomorrow. You can download the widget from the link which we’ve embedded below. It’s really not as useful when you realize that it has a $0.99 price tag on it should you wish to add more than three names.